Former Senator Pete Domenici, R-N.M., introduces former White House chief of staff Jack Lew during the Senate Finance Committee hearing on Lew's nomination to be Treasury Secretary on Feb. 13. Former Sen. Pete Domenici of New Mexico revealed Wednesday that he fathered a child outside his marriage three decades ago with the daughter of another former senator. Domenici, 80, a Republican who served six terms in the Senate before retiring in 2008, and the mother of the child each released statements to the Albuquerque Journal acknowledging Domenici’s fatherhood. The child, now grown, was identified as Adam Paul Laxalt, a lawyer in Las Vegas. His mother, Michelle Laxalt, is the daughter of Paul Laxalt, a Republican who represented Nevada in the Senate for 12 years before leaving in 1987. Michelle Laxalt said in her statement: “One night’s mistake led to pregnancy more than 30 years ago.” She said that she raised the son as a single mother, and that Domenici had agreed to keep his fatherhood secret because of their connections to the Senate. Domenici and Michelle Laxalt said they were releasing the information now because they thought someone else would shop it around to media outlets to damage Domenici’s reputation. Michelle Laxalt has been recognized as one of the most powerful lobbyists in Washington, and has appeared as a cable news pundit. In an appearance on “Larry King Live” on CNN in March 2007, she defended Domenici during a discussion about U.S. attorneys who had been fired by President George W. Bush’s attorney general. One of the fired U.S. attorneys had suggested that Domenici improperly tried to influence his handling of an investigation. Domenici and his wife had eight children together. 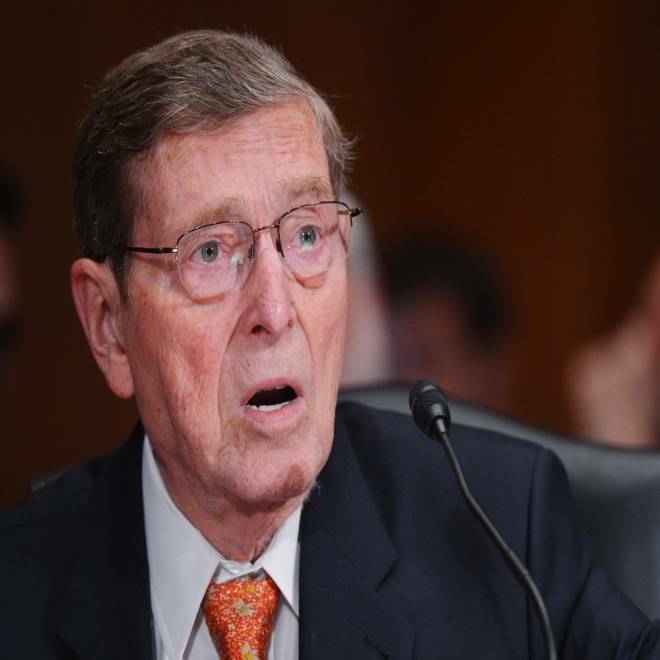 Domenici, reached at home Wednesday by The Associated Press, declined further comment. His statement said that his family has known for several months, and that he has “apologized as best I can” to his wife. The website of Adam Paul Laxalt’s law firm identifies him as a former naval officer who served in Iraq. Last week, another member of Congress, Tennessee Rep. Steve Cohen, said that he learned only three years ago that he has a daughter, now 24. Cohen, a Democrat, made the revelation after reporters inquired about messages he was sending to the woman on Twitter during the State of the Union address. Domenici was on Capitol Hill last week to introduce Jack Lew, President Barack Obama’s nominee for treasury secretary, at his confirmation hearing. The two worked together when Lew served as President Bill Clinton’s budget director and Domenici chaired the Senate Budget Committee.